Need motivation; surely there can have been no greater source of motivation for young Japanese female players than the success gained last week in Stockholm, when one after another, Mima Ito beat China’s elite in the guise of Liu Shiwen, Ding Ning and Zhu Yuling to secure Women’s Singles gold in the Swedish capital city. 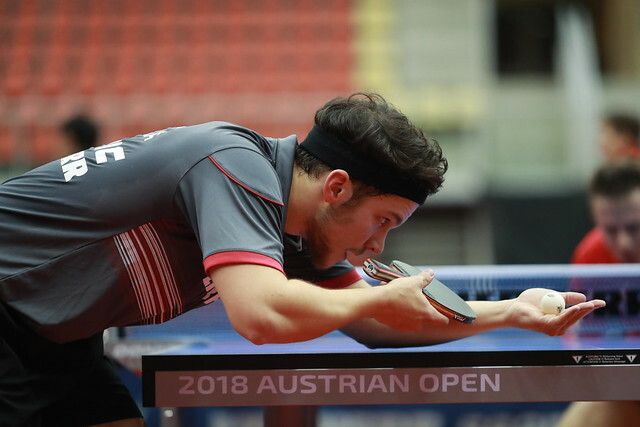 Now, on Tuesday 6th November, in the opening preliminary round of the Women’s Singles qualification tournament to gain places in the Seamaster 2018 ITTF World Tour Platinum Liebherr Austrian Open, there were inspired performances from compatriots four years the junior. Pick of the bunch was Satsuki Odo, the Under 21 Women’s Singles runner up earlier in the year at the year at the 2018 ITTF Challenge Croatia Open when beaten by colleague, Saki Shibata; by the very narrowest of decisions, she overcame Romania’s Daniela Monteiro-Dodean (11-9, 10-12, 5-11, 12-10, 5-11, 11-7, 11-9). Impressive from one Japanese 14 year old and it was impressive from another, Miyuu Kihara accounted for Alina Arlouskaya of Belarus (11-3, 11-6, 11-5, 11-3). Most notably at recent ITTF World Cadet Challenge in Tottori, Japan won the Girls’ Team title; neither Satsuki Odo nor Miyuu Kihara were members of that outfit. The fact underlines the current depth of strength in Japan amongst teenage girls; surely it has never been deeper? Equally, there was a splendid performance from a Japanese player of a generation earlier and one to some extent one who lives in the shadows. The younger sister of Kenta and Kenji, 23 year old Shiho Matsudaira was very much driven to higher levels. She beat India’s Manika Batra, the player who contrary to expectations guided India to Women’s Team gold at the Gold Coast 2018 Commonwealth Games, prior to winning the Women’s Singles event. Most imposingly, Shiho Matsudaira succeeded in six games (10-12, 11-6, 11-6, 12-10, 9-11, 11-8). Performances of note; also from the Japanese contingent, Yumeno Soma, Sakura Mori, Maki Shiomi and Mizuki Morizono attracted the attention. Yumeno Soma, only 16 years old, beat Thailand’s Suthasini Sawettabut (11-4, 11-2, 5-11, 11-9, 11-2), Sakura Mori accounted for Britt Eerland of the Netherlands (11-8, 11-13, 11-9, 12-10, 11-7). Similarly, Maki Shiomi ousted Marie Migot of France (8-11, 5-11, 11-6, 11-5, 11-8, 11-4); Mizuki Morizono ended the hopes of Poland’s Katarzyna Grzybowska-Franc (11-9, 8-11, 11-8, 11-7, 12-10). However, before we are carried away with recent Japanese success; China will have been doing their homework. Last week in Stockholm, Zhu Yuling was subjected to a torrid time by Miyu Kato at the quarter-final stage of the Women’s Singles (11-8, 11-4, 11-7, 10-12, 18-16). In the open preliminary round of the Women’s Singles event in Linz, Liu Gaoyang gave Miyu Kato a torrid time; she prevailed in four straight games (11-3, 11-7, 11-4, 11-6), a result to note.